While some stress is inevitable, when your body repeatedly encounters a set of physiological changes dubbed the stress response, trouble can brew. 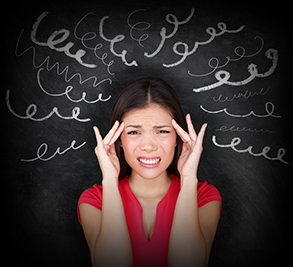 Stress may contribute to or exacerbate various health problems. But it’s possible to dismantle negative stress cycles. 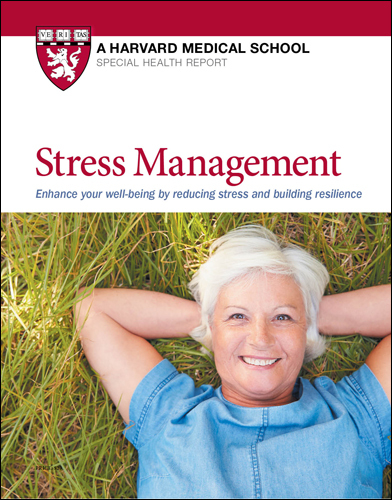 This Special Health Report, Stress Management: Enhance your well-being by reducing stress and building resilience, can help you identify your stress warning signs and learn how to better manage stressful situations. Stress constantly creeps into our lives. It can come from the frustration of a traffic jam or a confrontation with a partner. Stress can be spurred by money worries or spiked by a sudden health scare. It can exact a toll upon you — physically, emotionally, and psychologically. Stress is a fact of life. But you determine how it affects your life. You can counteract the damaging effects of stress by calling upon your body’s rich potential for self-healing. Stress Management, a Special Health Report from Harvard Medical School, is packed with strategies you can use to rein in the runaway changes unleashed by stress. These proven techniques can help you repel the consuming effects of stress and reclaim and restore inner peace. The report will show you how to elicit — at will — the relaxation response. This is the simple, calming opposite of the stress response. And it will introduce you to various methods of producing this response—from focused breathing to tai chi and repetitive prayer. Stress Management will help you explore cognitive restructuring, a strategy to change the way you look at things. You’ll find how to challenge negative thoughts and avoid jumping to conclusions. And, if you’ve heard about the power of visualization and meditation, but don't know where to start, the report will show you. The report will help you identify the warning signs of stress. It will alert you to the dynamic roles of nutrition and social support. It will give you tips for coping with caregiver stress, work-related stress, and stress from conflict with others. And you’ll find three rewarding mental exercises that boost happiness. Plus, a special section will show you how to take the sting out of ten common stressors — everything from being late to feeling burned out. You’ll be briefed on relaxation techniques to use when you have only ten minutes — or even just one. You’ll also get suggestions for communicating better, for learning to nurture yourself, and using mindfulness to reduce workday stress. What about stress in your life? Sometimes just thinking about embarking on a program of stress control can be stressful. Rather than freeze in your tracks, start small and bask in the glow of your successes. Give yourself a week to focus on practical solutions that could help you cope with just one stumbling block or source of stress in your life. Pick a problem, and see if these suggestions work for you. 1. Frequently late? Apply time management principles. Consider your priorities (be sure to include time for yourself) then delegate or discard unnecessary tasks. Map out your day, segment by segment, setting aside time for different tasks, such as writing memos or returning phone calls. If you get caught up online, put away distractions—no texts, tweets, emails, or games—while you dive into tasks. If you are overly optimistic about travel time, consistently give yourself an extra 15 minutes or more to get to your destinations. If lateness stems from dragging your heels, consider the underlying issue. Are you anxious about what will happen after you get to work or to a social event, for example? Or maybe you’re trying to jam too many tasks into too little time. Tracking time for various tasks can help you become more realistic. 2. Often angry or irritated? Consider the weight of cognitive distortions. Are you magnifying a problem, leaping to conclusions, or applying emotional reasoning? Take the time to stop, breathe, reflect, and choose. online sources, or call the local library or an organization that can supply the information you need. Write down other ways that you might get the answers or skills you need. Turn to CDs, books, or classes, for example, if you need a little tutoring. This works equally well when you’re learning relaxation response techniques, too. 4. Overextended? Clear the deck of at least one time-consuming household task. Hire a housecleaning service, shop for groceries online, convene a family meeting to consider who can take on certain jobs, or barter with or pay teens -- your own or local hires -- for work around the house and yard. Consider what is truly essential and important to you and what might take a backseat right now.